Note: Thanks to NetGalley and the publisher for providing the ARC of this title. Never judge a book by it’s cover? Pshaw, worthless advice. It’s a fair bet that any title bearing a glorious image of Rush Limbaugh trampling his godless, commie foes under the feet of his warsteed is not going to be my cup of tea. But the real reason to ignore this advice is not so much that a crappy cover very often does indicate a crappy book (with rare exceptions, eg Last God Standing). No, it’s that it urges you to miss out on the wonderland awaiting you if you catch a glimpse of exciting artwork and dive right out with nary a thought for cover blurb. I’ve been a fan of this style ever since my school friend acquired Soundgarden’s classic Louder Than Love LP on the same grounds. So it was that I was browsing through NetGalley’s available titles and stumbled across Katja From The Punk Band. Written by one Simon Logan. Nope, never heard of him. Published by ChiZine. Nope, sorry. But an awesome gritty photo of a heavily-pierced, moody girl sporting a mohawk and emblazoned with a Soviet-esque typeface? Yeah, I’ll take it. Something to do with islands and drugs and criminals, I didn’t pay too much attention. It was a good choice. 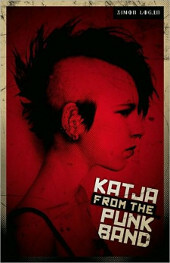 Katja From The Punk Band is a straight-up thriller with a dark, near-future, urban feel and hints towards sci-fi. The setting is an unnamed island, isolated from the mainland and supplied regularly by a variety of shipping vessels. The island is a grotty place, decaying and overflowing with all manner of undesirable, an air of violence and distrust looming large around every corner. Denizens of the island have seem to fall into two categories: those who are content with carving out their own niche in the industrial squalor and those who just want to get the hell out, although the second option is made nigh-on impossible by tight and unexplained restrictions on travel. Katja belongs to the latter group. A former junkie and general delinquent, she’s trying to make her way playing bass in her punk band with little hope of the future until her boyfriend(?) Janucsz is ordered by a local drug lord to smuggle a vial of a novel concoction to the mainland. There will be no need to return and he has a plus-one guest pass. Unfortunately things like this never go to plan – well, books would be boring otherwise – and after a violent argument with her man, Katja soon finds herself pursued by two major criminals, one enraged middleman, an addled junkie and her parole officer. All of these problems will disappear if she can only make it to the boat on time and hold on to the precious vial but a lot of bullets stand between her and that goal. Katja From The Punk Band is further evidence that great surprises lie in the most unsuspecting places. Given that I had zero expectations I rattled through it at a fair old pace, although it is admittedly rather short, and was pleasantly upset to find it ending so soon. I wanted more. The prose is terse and sharp, Logan wastes barely a word and has no time for flowery descriptions or scene-setting. Instead he lets the actions speak for itself, jumping between first-person viewpoints from chapter to chapter and leaping back and forwards in time in cinematic fashion as the narrative demands. Despite his bare-bones approach you get a real feel for the desperation blanketing the island and never feel the need to question its origins or background – it simply is. The cast of Russian names lends weight to the atmosphere, is this is a fantasy world or inspired by some very real enclave in the hidden recesses of the former Soviet empire? Despite a couple of questionable plot twists and action scenes – the parole officers role in things seemed kinda pointless to me for example – Katja From The Punk Band is a well-written and easily-digested piece of gritty modern urban fiction. There’s apparently a sequel already available, Get Katja, although I’d honestly be more interested to see what author Simon Logan can do when he turns his pen to other subjects. This is never going to win any Booker prizes but definitely worth a look if thrillers, noir and awesome punk anti-heroines are your deal.